My word for this post is "patches." Finally, I found sometime to write. I know I've been holding up my writing partner, but I got a rush of orders for Infiknit and well the orders come first!! Anyway, the delay has given me time to think about the word. It is actually my word, in the sense that it was my time to set the writing topic. In crazy quilting all of these patches would be joined with the fairy-like feather stitch. 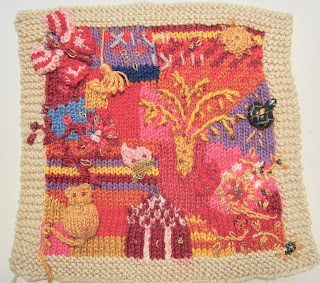 I can see myself in this stitch too, jumping from one activity to another in shades of pink and orange. Other patches would hold appliqués, or more embroidery - those rich moments that add depth to a few colourless hours - meeting a friend for coffee or reading a good book. 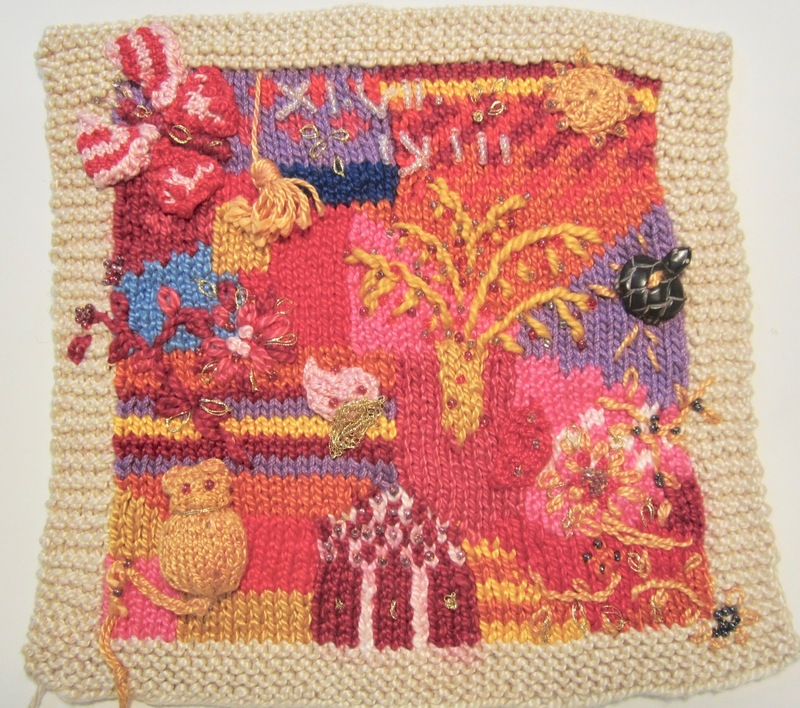 Ribbons, beads, buttons and other oddments will find a home somewhere on the quilt, like gems of thoughts that brighten our days. I wonder if this is the cosmos speaking to me. I have been reading a lot lately about the slow clothing movement, about up cycling, or mending, or repurposing the garments we might other wise throw out. There was a time when no one threw away anything. Fabric was expensive. 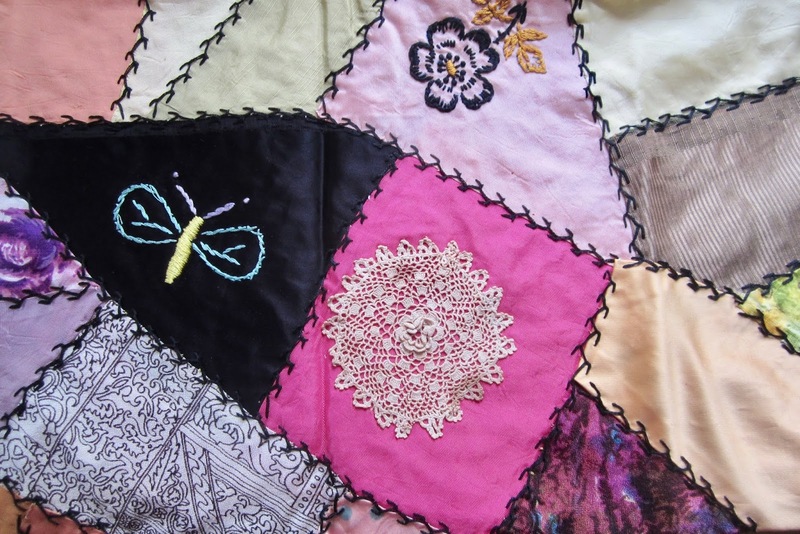 Every scrap was re-used again and again until it ended up in a patchwork quilt. Slow clothing is a movement to bring back this way of thinking. There is also a part of this movement that asks you to leave something of yourself behind. Something you have created to make the world a better place. My mother, towards the end, crocheted everyone an afghan. 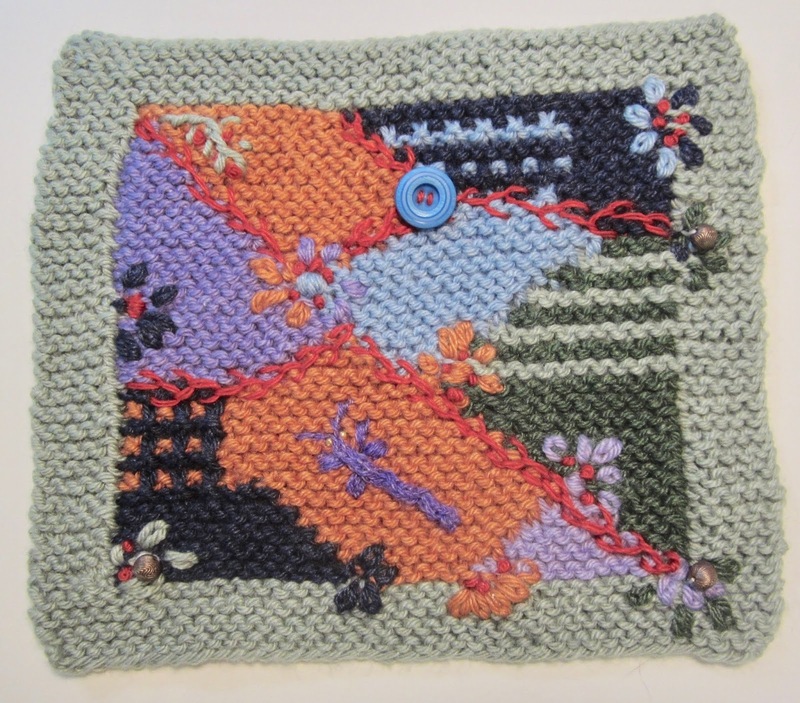 She used yarn from resale stores and created some lovely throws. I do, however, miss her smocking, which might have been captured in a quilt. 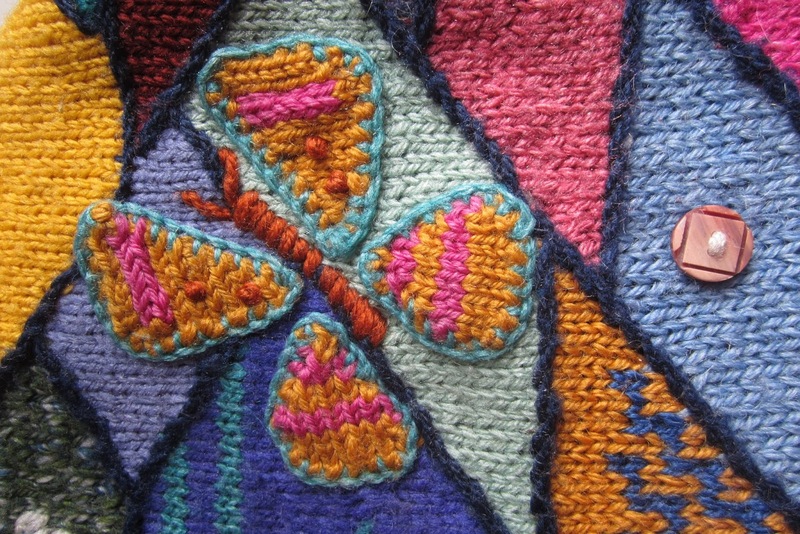 When I did work with fabric, I selected scraps from the garments I remember members of my family wearing. It was a way to hold onto them a little longer. Quilts are photo albums in fabric. Certainly we can touch a photo, but when we touch a piece of fabric, that was actually worn by someone, we come very close to touching them. 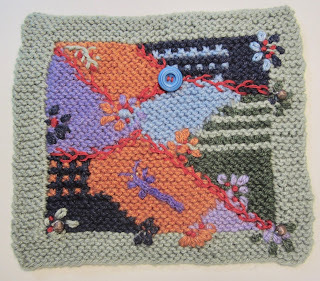 I quilt, but I knit more than I work with fabric, so my patches for the moment are knit. 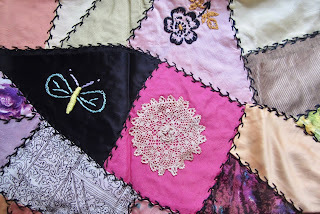 However, when I hauled out my old Crazy Quilt wall hanging, I though hmmmm, maybe I need to start doing some fabric stitching too.